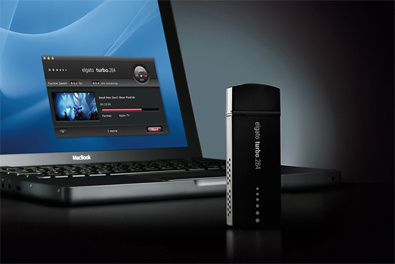 Elgato have released their USB dongle style hardware based video encoder in Australia. This means for Mac owners at least dramatically improved conversion speed to H.264. It comes at a time users are coming to terms with the process of automating playback from various sources including HD TV onto TV screens through hardware such as the AppleTV unit. What this means is that Free to air TV can be recorded, re encoded, then added to iTunes at break-neck speed so that the content will show up on your TV screen as content available for immediate playback. I also think that this will be an invaluable piece of gear for those who create content for the web. It will speed up the process of production even on smaller machines like the MacBook. Ideal for those creating 720p video for distribution via iTunes as video podcasts. I feel sure one will arrive in the PhotoGeek headquarters courtesy of Elgato retailer Big Trousers. How do you make them iTunesÂ¨-ready for your iPod or Apple TV? How do you put them on a Sony PSP? And how do you speed up an export process that can be agonizingly slow? The solution is Turbo.264, a blazingly fast and easy-to-use video encoder with a high-perfomance engine. Upon closer inspection it looks like the AppleTV export is set at 800 x 600 max and does not support conversion from Elgato 1080p to AppleTV 720p. This is a little disappointing as the product is made by Elgato for AppleTV hardware. Man…., I still have to wait for it to encode? That is the suckiest part of the conversion to iTunes.